Background: Facial lipoatrophy is a well known condition where extensive fat is lost in the face. It is seen primarily in the loss of the large buccal fat pad with subsequent concavities developing under the cheekbones and in the temples. While it occurs all over the subcutaneous layer of the face, which contributes to the skeletonized look, the greatest volumetric loss is in the submalar cheek area. 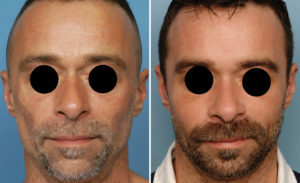 Facial lipoatrophy occurs in varying degrees and young patients undergoing surgery for more defined facial features are really seeking a level I or II facial lipoatrophic look. However, when it becomes more severe (levels III to V) it is not an attractive facial look and the patient appears unhealthy and even sickly in level IV and V lipoatrophies. For a more stable method of volume addition, implants have a valuable role. But a standard cheek implant, which primarily augments the bone, is not where the fat has been lost. Rather it is under the cheekbone where the volume addition is needed and is why submalar cheek implants are used. 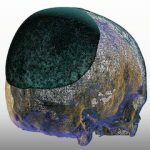 As seen in this skeletal model, such implants are designed to sit on the underside of the cheekbone so the influence of the material can extend partially into the buccal space. Case Study: This young male had a level III/IV facial lipoarophy. The greatest loss of fat was in the ‘trampoline area’ (between the cheek and jawline bones) of which the buccal fat has a major influence. Under general anesthesia and through a intraoral approach, medium submalar implants were placed. The key to their positioning is that some of the implant rests on the masseter fascia right below the inferior edge of he cheekbone. Secure positioning is needed which requires a small titanium screw. His results demonstrates the value of an implant in the cheek area that is also designed to augment the deficient soft tissues and not just the bone. Submalar cheek implants are useful in facial lipoatrophy but are not a complete solution. Temporal implants can address the temporal hollowing at the same time. Filling in the midface where the submalar cheek implants do not affect can be done by fat injections, longer acting injectable fillers and the surgical placement of allogeneic dermal grafts. 1) Facial lipoatrophy has its most significant effects in the under cheek or submalar area. 2) Submalar cheek implants are inserted intraorally and usually secured with a single screw given its position on the bone. 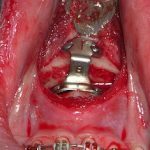 3) Fat grafting or other methods of soft tissue augmentation around the submalar implants may be of additional benefit in more severely affected patients.